The third party controller market seemed to peak in the 16-bit era but there were plenty of third party controllers in the 32-bit era and even today. This particular ad is for a company called NAKI that developed controllers and other accessories. However, the latest stuff I could find from them is for the PS2. This ad is highlighting a gun controller by NAKI for the PlayStation, Sega Saturn, and Nintendo 64 called the Lunar Gun. What is unique about this particular gun is that there was also an optional accessory for it called the Red Sight Laser Target System. That’s a pretty fancy name for something that basically amounted to a laser pointer. In theory, it makes it easier to hit what you are aiming for because, just like a laser sight on a real gun, you just have to put the red dot on what you are trying to hit. Overall, the Lunar Gun was a pretty good choice if you needed a light gun. It’s main competition was the Justifier and while that one is better known, the Lunar Gun has more options like auto-reload, easy (three round burst) and a laser sight among others. My one problem with it is philosophical. I’m not sure I could see buying an accessory for my accessory. I couldn’t find prices but i’m guessing the price of the Red Sight Laser Target System was not trivial making the combined price of the gun pretty hefty. It would have been nice if they could have just made a slightly more expensive gun and included the laser. They probably felt that they couldn’t have competed on price with the Justifier that way and that once they suckered you in with the gun then you would want to buy the laser anyway. No doubt the gun packaging includes advertising for it. 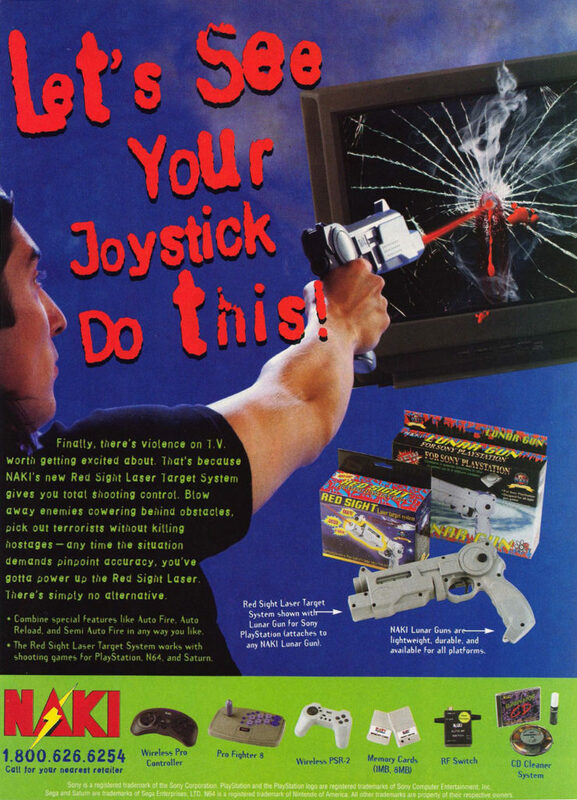 This ad is from the August 1997 issue of Electronic Gaming Monthly.